Lea Thompson, Tate Donovan and Leaf (Joaquin) Phoenix wear white and grey high top Converse “Chuck Taylor” All Stars in the film. A group of five kids and their pilot team leader accidentally get launched into space. Spacecamp begins with little Andie looking up at the stars and dreaming of becoming the first female mission commander. In 1986, adult Andie (Kate Capshaw) is a skilled pilot and very bitter because she’s been rejected for another space mission but has been asked to host Spacecamp at NASA again. She arrives, along with the film’s five young main characters, all played by actors in their mid-20s. Kathryn (Lea Thompson), is a bookish girl who wants to be a mission commander, to Andie’s chagrin; Tish (Kelly Preston) is a dated 80s new age girl with a photographic memory and 100 percent retention; Rudy (Larry B. Scott from Revenge of the Nerds) lacks confidence; and Kevin (Tate Donovan), who is cocky and irresponsible, but totally cool (he wears sunglasses and drives a jeep!). There’s also Max (12-year-old Leaf Phoenix, today known as Joaquin), who is a Star Wars fan and has a literal-minded robot friend named Jinx. 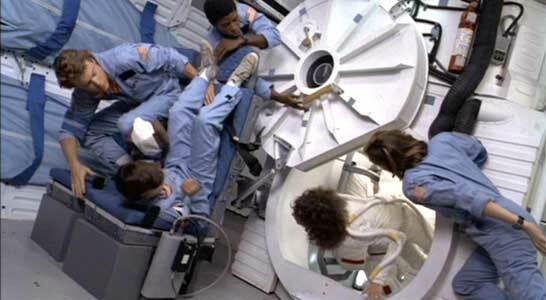 The SpaceCamp crew gets ready for shuttle separation. At SpaceCamp, these five youths quickly bond and become friends while also learning astronaut stuff, including, but not limited to, engineering, leadership and physical endurance. That’s basically it. Bonding and training. At one point, a bullied Max bemoans to Jinx that he wishes he could go into space and be like Luke Skywalker. Jinx loves Max, so he masterminds an implausible scenario where Max and his friends can do exactly that. Jinx links into the NASA computer. When the kids, with Andie, get the chance to sit in a real shuttle while the rockets are tested (which is something NASA actually does on occasion), the shuttle is launched into space! In space, the group faces several challenges. They’re low on oxygen (the shuttle wasn’t supplied for an actual launch), so they get some from a space station. There, Andie is knocked out and sent adrift. She retrieved, but soon they have minor electrical repairs to make. They devise a way to communicate with NASA. And, they have to secure a new landing vector after missing their window. They all return home safely, a little wiser and with a story to tell. 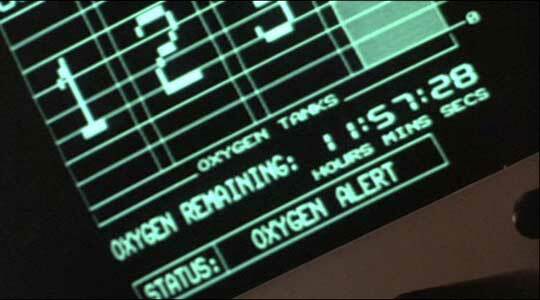 The SpaceCamp crew discovers that they are low on oxygen. Kathryn learns that she is a good pilot, but a lousy leader. Kevin embraces responsibility, and leads the team. Andie, before she’s knocked out, gets to command a shuttle in space. And Max gets to live out his fantasy of being Luke Skywalker, albeit in a puffy spacesuit. The other two contribute substantially, though their characters don’t develop much. There’s not much substance to this film. All of the characters are likable and well-played by the cast. They’re fun, but they don’t do much except bond and learn at camp. The film lacks a clear objective until they’re launched into space. After that, the tone of the film is radically changed. The teens have very clear objectives and can’t be distracted. We want them to succeed, because we liked them earlier, but their situation is so deadly serious it just stops being light fun. More so, the film is light fare so the deadly situation isn’t that deadly, which cuts deep into the suspense. A concerned NASA control room anxiously watches the progress of the shuttle. The film also lacks a single star. Each character is given attention, allowing for depth, but the story suffers for it. We need someone to lead us into the story, to be its focus. When each character becomes the focus of a dilemma or resolution, it’s just trite. The star isn’t Andie, because she’s knocked out and for a while functions as more of an antagonist. It’s not Kevin, because he doesn’t do anything really until he becomes leader. It’s not Max, who is more of a plot device when not an avid observer. Who’s left? The whole film becomes a mild diversion. In the 80s, it was hip and even relevant in the time of Reagan’s deficit-creating SDI space-based weapons program (which failed). Now, it’s a mild curio for retro-enthusiasts. Those people won’t be disappointed, though it’s no Back to the Future or The Goonies, or any of many, many other films. Anyone who sees Spacecamp will enjoy it. It’s not a bad film. It’s quite pleasant. And SpaceCamp is fun, even when it’s depicted on screen and it’s other people who are there. Space travel is romantic. 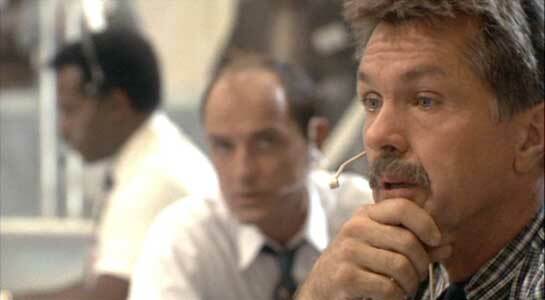 And, it was filmed on location at NASA’s Marshall Space Flight Center in Huntsville, Alabama for authenticity. Still, it’s too real to be fantasy, and then too fantastical to be real. The end result is indifference. Bruckheimer’s Top Gun was released the same year, heralding a coming shift from fantasy to manly action anyway. Andie enters the space walk chamber. Kathryn eagerly climbs into the space shuttle. 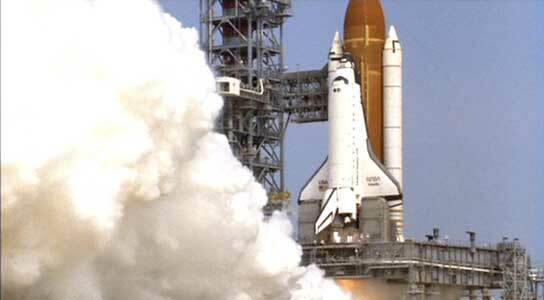 The crew loads into the space shuttle, taking their places and seats. They have to climb vertically to their stations, so we see that for team members Kathryn, Kevin, and Max, their footwear of choice for space travel are white and gray high top chucks, respectively. Later, Kevin explains to Max how to use the shuttle’s bathroom tube. (It was argued to me that it was for number one, but I think it’s for number two because, mechanically, that’s way funnier.) Once Max figures it out, he sits behind the curtain and relieves himself, his feet relaxed below the curtain. Max has figured out to use the bathroom tube, to his great relief. SpaceCamp. (1986) Kate Capshaw, Lea Thompson, Kelly Preston, Larry B. Scott, Joaquin Phoenix, Tate Donovan, Tom Skerritt. Directed by Harry Winer. Categories: Drama, Action/Adventure, Teenagers.